Cities and cathedrals are closely related in England. Mainly because a conurbation can only call itself a city if it has a cathedral. As a result, there are relatively small places called cities and larger places which are not. Ripon in Yorkshire appears to be the city with the lowest population, approximately 16,000 people. 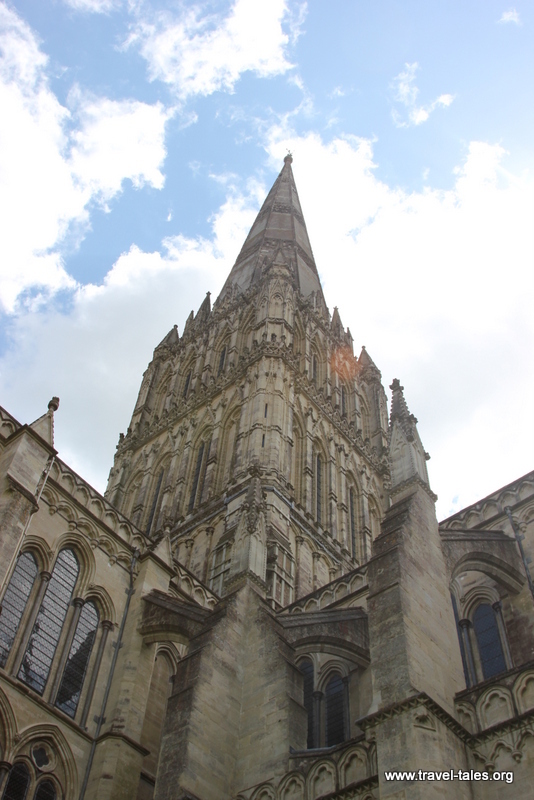 Salisbury in Wiltshire is also at the smaller end of the scale with approximately 40,000 residents; and more importantly a cathedral. This was another visit with my friend Randy, who takes far better pictures than I do, so these are his. This is the spire seen over the roof of a local old building. We didn’t take a good enough picture of the plaque to remember what the it originally housed – I’ll have to go and visit again! The Walking Madonna by Elizabeth Fink has been placed in Cathedral Close is a reminder that Jesus’ mother was part of her community during her lifetime, walking and living among her peers. The cathedral itself is a wonderful example of engineering, architecture and craftsmanship from the footprint of the church, its wide spanned roof and the detailed masonry carving of saints. As a follow up to this you should pay a visit to Wells – the smallest city in UK, and part of Bath and Wells diocese. Sounds like a plan, I went to Wells once as a schoolgirl. Time to go back!